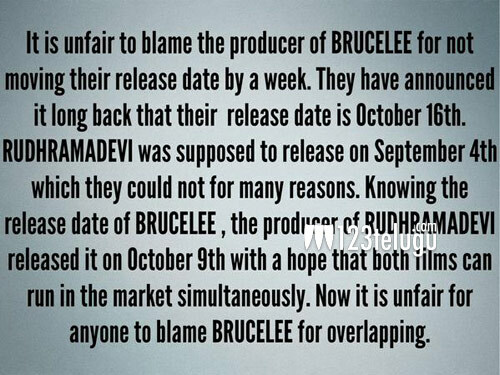 Legendary film maker, Dasari Naraya Rao created a stutter when he hinted that upcoming films like Bruce Lee, which are coming out this week should be postponed in order to ensure Rudramadevi a smooth run at the box office. Reacting strongly to Dasari’s statements, stylish star Allu Arjun came to the aid of Bruce Lee and said that the release of Charan starrer was planned a long time ago and his team was clearly aware of this fact and released Rudramadevi so that both the films can run smoothly in this lucrative festive season. Bruce Lee is set for a mammoth release this Friday and Rudramadevi, which released last week is doing superb business at the box office.